The dog Bret Easton Ellis lives in a brothel, where the prostitutes name their dogs after unpleasant male writers. Bret Easton Ellis is purchased by a man named Rodrigo as a present for his wife, Encarnación. Encarnación is having an affair with a man named Ilich. Ilich is the boyfriend of a writer named Alba. Alba and Rodrigo are friends, sort of. When Alba somehow learns her teenage upstairs neighbour, Araceli Villalobos, is advertising her services as a prostitute, she asks Rodrigo to become Araceli’s first client. Rodrigo declines to sleep with Araceli and instead tells her the story of himself, Alba, Ilich and Encarnación. Forget about the dogs of the title; they barely feature. The whole book is overlapping loops of plots circling the question: who is Alba? She is from central Spain, and a well-regarded author. Some of her short stories, which are included in their entirety or described in detail, are about an isolated girl growing up under the thumb of a hateful and neglecting mother; it is strongly implied these are the facts of Alba’s childhood. As an adult, she develops an entourage in her small flat in Barcelona. This group eventually includes one of Araceli’s teachers, an Italian boyfriend, a Guatemalan servant, Blosom, and Araceli’s mother, Mariela. A question the book doesn’t explore: who is the narrator Araceli? She is the kind of person who exists only to narrate novels about other people. But she’s not even a Nick Carraway, privy to observations hidden from other characters for the readers’ benefit. Araceli is a vessel to be filled with the stories of others. She sits in silence as other people talk, recording verbatim the stories they tell without interruption or even a stage direction. She has hardly any identity, or even a body; her only direct action in the book is, as a child, falling in love with an adult stranger on the beach who she convinces to buy her ice cream. Even her choice to prostitute herself is done at the impetus of her only friend, Muriel. Muriel and Araceli are studying at a school for translators attended almost exclusively by young women. Once they are taken on a field trip to a timber factory. Blosom warns Araceli about the world of business, “… don’t let them sell you like a bag of meat along the chain from one supplier to the next.” Over the slow course of the book, we are meant to realise that women are bags of meat. Women are timber. Women are tadpoles swimming with the big fish. Women are potted plants. Women are canaries released from their cages. Teenage girls are not usually known for the quiet acceptance of being turfed out of their childhood bedroom for a stranger on a neighbour’s whim. And it’s unlikely that, in the event, they would acquiesce based on the rearrangement of their furniture. But the people in this book are not supposed to act like people. They aren’t even supposed to be people. They are ideas, amorphous substance without flesh. The greatest flaw of the book is that Wolff forgot that trees cut into timber had their own shape first. It all goes back to her choice of title. The metaphor of the surname ‘Villalobos’ (Spanish for ‘house of wolves’) was obviously not thought enough. But the dogs in the brothel don’t appear in the book until page 245 and disappear three pages later. Rodrigo is told that they are kept in the event one of the prostitutes is abused by a client, so that she has a safe outlet for her rage. One would have thought that prostitutes would have a smorgasbord of choice from real life to select from when seeking naming inspiration in these circumstances. But how would a book about metaphors for women grab attention without a gimmick like a noisy, masculine title? The most annoying thing is that, on a surface level, Wolff’s writing style works. The images are crisp as starched linens and as sharp as thorns. But the novel is a cuckoo clock, full of complicated interlocking mechanisms that sometimes surprise us by being almost lifelike. So while the book is readable, and smart, and there is plenty of fun to be had in connecting the dots between the anecdotes, it doesn’t add up to much. Wolff’s writing is good enough that her second novel will certainly be better, as long as it includes a beating heart. If Bret Easton Ellis and the Other Dogs had this, we’d at least learn what happens to the creature of the title. Lina Wolff has lived and worked in Italy and Spain. During her years in Valencia and Madrid, she began to write her short story collection Manga manniskor dor som du (‘Many People Die Like You’; Albert Bonniers Forlag, 2009). Bret Easton Ellis and the Other Dogs, her first novel, was awarded the prestigious Vi Magazine Literature Prize and shortlisted for the 2013 Swedish Radio Award for Best Novel of the Year. She now lives in southern Sweden. Her second novel, De polyglotta alskarna (‘The Polyglot Lovers’), is forthcoming from Albert Bonniers Forlag in 2016. Frank Perry has translated the work of many of Sweden’s leading writers. His work has won the Swedish Academy prize for the introduction of Swedish literature abroad and the prize of the Writers Guild of Sweden for drama translation. 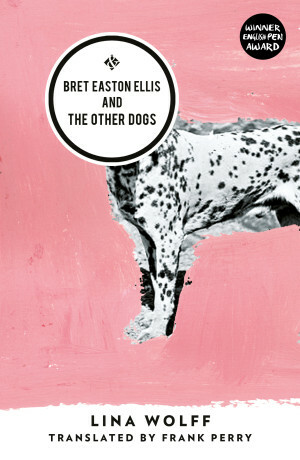 Bret Easton Ellis and the Other Dogs is published by And Other Stories. Posted in Book reviews and tagged bret easton ellis and the other dogs, lina wolff, spain. Bookmark the permalink.